FlexPod Datacenter with Citrix and NVIDIA enhances virtual desktop infrastructure to encompass real-time 3D graphics capabilities. This new solution, FlexPod Datacenter with Citrix XenDesktop and NVIDIA GRID brings together best-in-class components to overcome the challenges graphics-intensive visualization workloads. We have been fighting storage IO battle since day one. There are many flash technologies on the storage vendor side. Now Citrix Provisioning Service has an awesome and easy to use feature called RAM Cache on the hypervisor RAM that can reduce storage IO by 90%. RAM cache is great for PVS non-persistent desktops. For MCS or any persistent desktops, RAM cache is not ready yet. I tested RAM Cache last year. The result was unbelievably good. I shared at NetApp Insight Vegas and Berlin. In January, I attended Dan Feller‘s session “Technical Update for XenApp and XenDesktop – 2015 Edition” at Citrix Summit. Now it is time to promote RAM Cache. How to use RAM Cache? 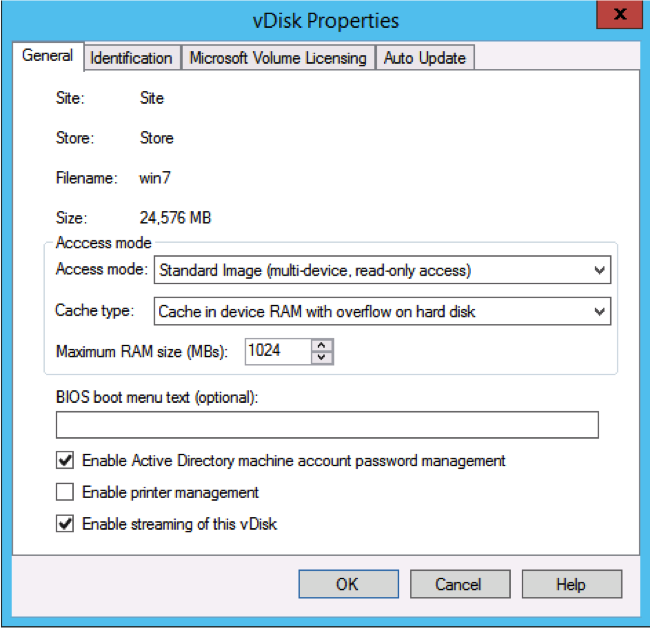 At PVS console, select vDisk properties and choose Cache type as “Cache in device RAM with overflow on hard disk”. This will use hypervisor RAM first and then use hard disk. Choose the RAM size based on OS type. More detail on sizing RAM cache, check Size Matters: PVS RAM Cache Overflow Sizing. Also as a best practice, defragment the vDisk before deploying the image and after major changes. I ran 4 tests to find out if RAM cache is useful and what is the optimized RAM Cache size compared to Citrix’s recommendation. Test result: I use NetApp perfstat to capture the write cache NFS volume total IOPS. The blue line is the result without RAM Cache. The IO saving is tremendous. What is the lesson learns? Reduce storage IO. The data is from Dan Feller’s deck at Citrix Summit. Hope I can meet you at Vegas! Hope you are as excited as we are for Insight 2014 Las Vegas! I will have 6 NetApp break sessions and a XenDesktop on Hyper-V lab. This will keep me busy. Also you can find me at virtualization booth. Hope I can meet you in Vegas! Design guide for Citrix XenDesktop on NetApp Storage is published today. The Citrix XenDesktop 7.5 system, which now incorporates both traditional, hosted Windows 7 or Windows 8 virtual desktops, hosted applications, and hosted shared Windows Server 2008 R2 or Windows Server 2012 R2 server desktops (formerly delivered by Citrix XenApp) provides unparalleled scale and management simplicity while extending the Citrix HDX FlexCast models to mobile devices. NetApp clustered Data ONTAP—with its key capabilities such as nondisruptive operations, unified storage, multiprotocol architecture, secure multi-tenancy, storage efficiency, read and write performance, and cost efficient data protection—is ideal for cost-effectively designing and deploying end-to-end storage solutions for desktop virtualization based on a single or mix of various XenDesktop FlexCast models. This technical report provides key storage design and architecture best practices for deploying a mix of FlexCast technologies on a NetApp clustered Data ONTAP storage array. It also includes performance testing results and solution scalability guidelines that prove that NetApp clustered Data ONTAP can cost effectively scale to thousands of desktops without adding complexity. As a solution architect in a storage company, I am often asked by customers and sales engineers how many IOPS per desktop. My answer is always it depends. Virtual desktop IOPS is a myth. It varies by application, the stage of the workload, provisioning methods, and hypervisors. VDI IOPS is like different size nails, some are small like 2-3 IOPS per desktop, some are big like 20-30 IOPS. 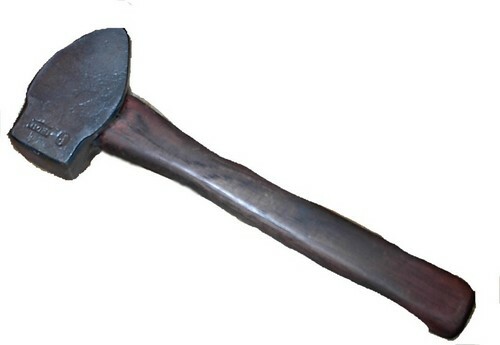 The easiest way is to have a big hammer to be able to hit nails in all size. NetApp finally revealed all flash FAS ( AFF), the big hammer. NetApp offers All-Flash with advanced data management delivering high performance, advanced data management, and low cost per desktop. The NetApp All-Flash FAS solution shares the same unified storage architecture, Data ONTAP OS, management interface, rich data services and advanced feature sets as the Hybrid-FAS solution. This unique combination of All-flash media with Data ONTAP delivers the consistent ultra-low latency and high IOPS of all-flash storage, with the industry-leading clustered Data ONTAP OS. In addition, it offers proven enterprise availability, reliability and scalability; storage efficiency proven in thousands of VDI deployments; unified storage with multiprotocol access; advanced data services; and operational agility through tight application integrations. We recommend to use AFF when the IOPS is > 20IOPS per desktop or ultra low latency like < 1ms is required. Fast login means in virtual desktop deployment. We can control how many VMs to boot at the same time but difficult to control the number of simultaneous user login. This makes fast login even more important. During our 2000 seats vSphere and XenDesktop reference architecture, we tested a few cases and the goal is to login 2000 users within 30 minutes. The test result clears some misunderstanding on the importance of NetApp Flash Cache for Citrix PVS work load. PVS write cache is mostly writes and some may think Flash Cache read acceleration is not useful. During login, there is profile read/write IOs, vDisk read IO, and write cache write IOs. NetApp Flash Cache is important for user profile read acceleration. For FAS 2000 series when you cannot use Flash Cache, Flash pool is recommended to accelerate read and write IO. To make sure that the user profiles and settings are preserved after the desktops are reprovisioned from the updated vDisk (as a result of desktop patch, update and so on), we leverage the profile management software like Citrix UPM to redirect the user profiles to the CIFS home directories. Some user settings and data can be redirected by means of folder redirection. However, if folder redirection is not used these settings are stored within the user profile. Adding a policy to exclude the redirected or unwanted folders from roaming or synchronization is very important to reduce IO during login. Using Citrix Profile Management, you need to add all of the redirected folders to the folder exclusion list and you should also at a minimum add the following additional folders to the exclusion list: “AppData\Local”, “AppData\LocalLow”, and “Local Settings”. Check the screen shot of CVD on HVD policy, notice the exclusion list. NetApp recommends using a profile management solution such as Citrix User Profile Management (UPM) to allow end users to customize their experience in a nonpersistent desktop environment. NetApp Flash Cache/Flash Pool and Citrix UPM are essential to lower user login IOPS and login time. Also for more information on how to set profile in XenDesktop deployment, check Dan Allen’s blog: http://blogs.citrix.com/2012/02/11/citrix-profile-management-and-vdi-doing-it-right/.